This is the first Dev-Diary that is being posted on this site that is not being published in parallel with my other progress-posts (Newgrounds and DeviantArt). What this means is on this website, I’ll be posting twice a month (1st and 15th), while only once a month on the other sites. I spent a lot of these past two weeks juggling a lot of different aspects of the demo; I’ve set-up the skeleton for the free-running level (the most complicated area where people can experiment with the majority of the player physics) and worked on the visuals for the other levels. However, I’ve spent a lot of this time working on the visual assets and fixing bugs. Because this is a demo, the visual side of this mini-project is odd: I want to show-off what is possible, what I am capable of, and test varying degrees of visual data being processed during a test. However, this is just a demo, and while I will be using this to hopefully get some people interested in backing my games, I don’t want to put all my efforts into making this pretty, as that time can be spent finialising code and preparing for the first major project. So visual assets are essentially my folders of little re-usable walls, floors, ceilings, and objects that I can throw into the level to make it visually appealing without the time wasted on drawing it all. Of course, this is how all the other games will be made, to a degree, but the demo will feature predominantly recycled assets. With the bugs, I am happy to say I have FINALLY fixed angled collision. While each level only seems to feature one or two angled floors, they are a crucial player mechanic as they serve as either an obstacle, or a boost (depending on the player’s approach). So having the player clip through ramps if they hit them at a certain speed, or fly off the end if the ramp was at the wrong angle, became a major issue. But it is a major relief to say I believe they have been completely and complexly patched. This comes along side many other bug-fixes such as sliding through walls, grinding through walls, and generally moving through things that should not be moved through. Well that’s it for this mid-month post! I’m going back to work, so everyone have a wonderful rest of the month! Welcome to the first Dev-Diary on my own site! From now on, I will be posting here twice a month (1st and 15th), but still continuing the same posts on both Newgrounds and DeviantArt for the time being. During this time, the website will continue to be updated and tailored to assist me delivering news on my production progress! To bring this website up to speed, for about the past 2 years, I’ve been on/off working on a Flash-based micro-game engine called the Monochrome Engine; a 2D side-scrolling non-linear RPG engine with focus on player movement. What started out as a learning task (making a game engine is a good way to learn how they work!) soon became a full-time project. Now, the engine is in a working state and I am preparing a demo for both testers and potential sponsors, in an early bid to get everything ready for the string of projects I have lined up! 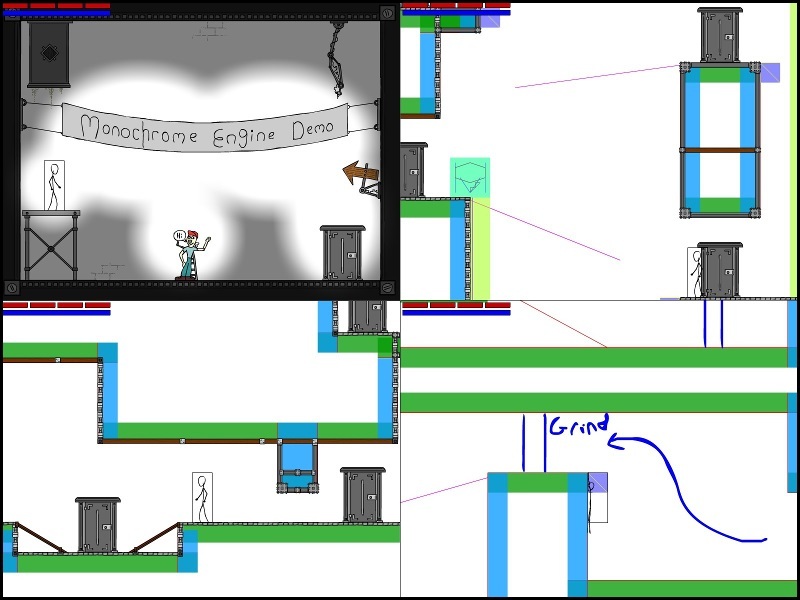 Continuing on from where I left off with my last dev-diary, (available on Newgrounds and DeviantArt) the engine has revealed a nice selection of bugs that have occurred in the physics functions outside the developer environment. While most of these have been fixed, there are still a few problems that are being addressed. However, I have still been working on the levels for the demo, as well as preparing a handful of visual assets to be used through the demo. I would like to have this demo done in a month’s time, but that comes down to how the bug-fixes work out, as the physics functions are some of the earliest code and re-writing them has been proving quite the task, but not one greater than I can accomplish! Below you will find a little screen-dump of some snaps from the demo, where you can compare a nearly-finished room to a hardly finished one. Check back on the 15th for the next update on this website! And don’t forget, if you would like to be a tester for the demo of this engine, send me a message either on this website, or to my Newgrounds or DeviantArt accounts.